Best Siberian in Show, and went on to win Best in Show Kitten and Best in Show Overal (out of 174 Cats of all age groups) at the FB (Fife) Viking Cat Club Show, December 2009. 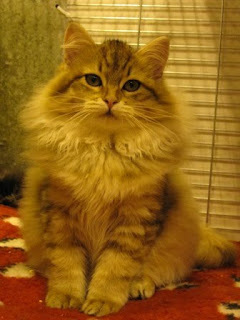 Best Siberian Trophy remains in the Musrafy Cattery for the Third Year running! Foxy you are a 'star'. You are a beautiful girl - and Timosha - your older brother - sends love and hugs - says that you get the 'good looks' from him!!! Thank you! Lots of hugs to Chantaris cats too.